For Russian political dissident and publicist, see Sergei Aksenov. Sergey Valeryevich Aksyonov (Russian: Сергей Валерьевич Аксёнов, Ukrainian: Сергій Валерійович Аксьонов, Romanian: Serghei Valerievici Aksionov; born 26 November 1972) is the Head and Prime Minister of the Republic of Crimea from 2014. which is an internationally disputed federal subject of Russia located on the Crimean Peninsula. Sergey Aksyonov was born in Bălți in the Moldavian SSR on 26 November 1972. His father was the leader of a group called the Russian Community of Northern Moldova in Bălți. In 1989, he moved to Crimea and enrolled in a college for military engineers in Simferopol; however, the fall of the Soviet Union occurred before he could graduate from the academy to become a Soviet Army officer. He then refused to swear an oath of allegiance to Ukraine, which he considered 'an unjustly severed appendage of Russia'. From 1993 to 1998, he was deputy director of a company named Ellada, a business related to food products. From October 1998 to March 2001, he was deputy director of the Asteriks company and since April 2001 he has been deputy director of the Eskada company. Aksyonov is also the head of Crimea's Greco-Roman wrestling organization, Sports club Hwarang-do. Aksyonov received his Ukrainian passport on 12 August 1997. Sources have alleged that Aksyonov served in the mid 1990s as a lieutenant, or overseer, with the nickname "Goblin" in the organized criminal gang "Salem". Aksyonov's connection with the criminal world is acknowledged by the former chief of militsiya in Crimea, Hennadiy Moskal (1997–2000). In 1995, some members of Salem had taken office as local deputies, receiving Legislative immunity. "Aksyonov used to work side-by-side with another gang member, Serhiy Voronkov, in the early 1990s. Voronkov is a well-known mafia boss who was released from prison in 2008 and is still doing business in Crimea," said Andrei Yanitskiy, a journalist of Livy Bereh newspaper who investigated Aksyonov. A native of Sevastopol, Yanitskiy alleges that Aksyonov is still a member of the Salem gang. According to Mikhelson, Aksyonov started his criminal career in the gang "Greki" (Greeks) that was created in Crimea by the Savopulo brothers, and only later Aksyonov switched to more notorious "Salem". In 1994, authorities were suspecting him and Aleksey Zhuk in the killing of Oleg Fenyuk through a contract. Although the Greki were liquidated, unlike many others Aksyonov managed to survive. The same Zhuk was killed 10 minutes after his phone talk with Aksyonov, which raised suspicions among the former "partners". In January 1996, Aksyonov was wounded after a Volvo car in which he was driving overturned on the Simferopol–Moscow highway ( ) during a shootout. According to official documents, the intended target was Samhan Mazahir-oglu Agaev (nicknamed "Sani"). Beside Agaev and Aksyonov, Aleksandr Bogomol and Pahrutdin Aliev were also in the vehicle. The hit was conducted with automatic weapons by militants of the Greki gang Ruslan and Rusel from Yevpatoria who were driving a black Samara. The hit was contracted by Ivan Savopulo. Both Ruslan and Rusel were arrested on 24 January 1996, but were released due to lack of evidence. 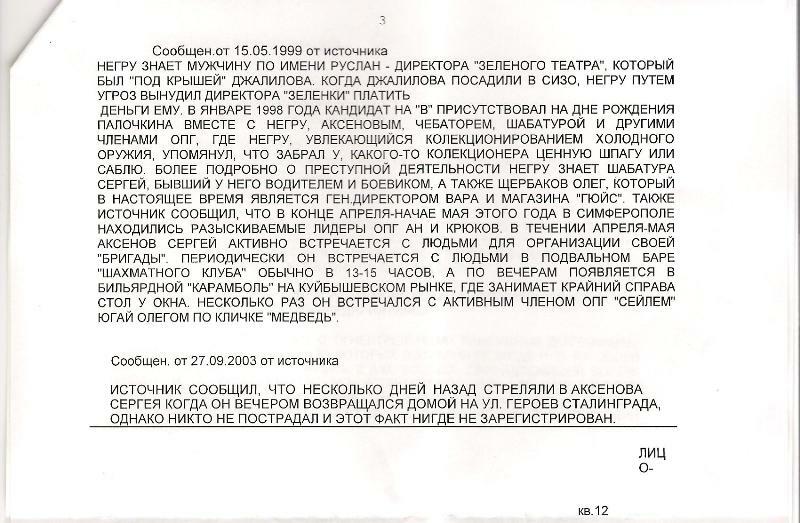 In 1997, the chief of Bakhchysarai patrolling unit Berezhnoi claimed that Aksyonov, with a former Major of militsiya, Vladimir Berenshtein ("Ben"), killed a chief of the Crimea network of heat supply Kuzin and a director of an alcoholic factory. A HUBOZ operative stated that Aksyonov kept close relations with Sergei Voronkov ("Voronok") and the "godfather" of Salem Vyacheslav Sheviev (leader of Party of Economic Revival). Coincidentally, members of the Party of Economic Revival were involved in the establishing of the Azerbaijani separatist organization Nagorno-Karabakh Republic. Around that time, Aksyonov started to buy and stockpile weapons. There is suspicion that the regional office of General Prosecutor of Ukraine received $60,000 to discontinue the investigation into the murder of Volodymyr Tykhonchuk. Aksyonov also received all the assets of Agaev who was killed in the spring of 1997. By 1998, both Salem and Bashmaki had become the most powerful gangs in Crimea and the President of Ukraine was forced to send special operations units of militsiya and the Security Service of Ukraine to restore order in the region. Aksyonov sued Mikhail Bakharev, Vice Speaker of the Crimean Parliament in 2010, for alleging such improprieties. Although the court of the original jurisdiction ruled for Aksyonov and demanded that Bakharev publish a retraction, the decision was overturned by an appellate court which determined that there was no evidence to disprove the allegations. Andriy Senchenko, a Crimean member of Verkhovna Rada from Batkivshchyna party alleged that Aksyonov was involved in these activities together with Supreme Council Chairman, Vladimir Konstantinov. 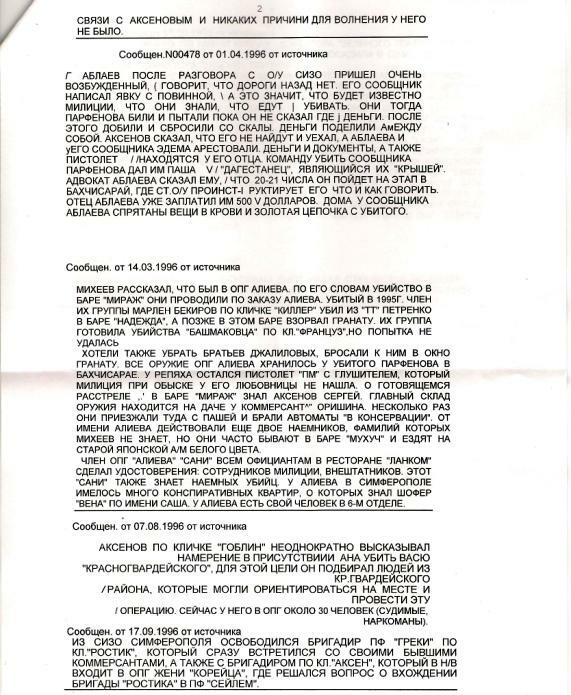 Senchenko alleges that "there were reports that he participated in the contract killing of (Volodymyr) Tykhonchuk [in 2004], then head of Crimean State Securities Commission, and before that in the killing of head of State Property Fund (Oleksiy) Golovizin [in 1997]." Aksyonov was investigated by the police for both murders, but has never been prosecuted. Senchenko believes Aksyonov managed to evade criminal responsibility due to his connections on the peninsula. During the armed occupation of the Crimean parliament by Russian forces under his command, Aksyonov was voted into office following a vote of no confidence in the new Ukrainian government. Already having well documented links to organized crime, since 5 March 2014, he has been wanted by the Ukrainian Security Service after being charged under Part 1 of Article 109 of the Criminal Code of Ukraine ("Actions aimed at the violent overthrow, change of constitutional order, or the seizure of state power"). Aksyonov was granted Russian citizenship as a resident of Moldova on 10 January 2003. In 2008, he became a member of the "Russian Community of Crimea" ("Русская община Крыма") and a member of public organisation "Civic Asset of Crimea" ("Гражданский актив Крыма"). Kirilchuk states that in 2008–2009, Aksyonov borrowed almost $5 million from Mykola Kirilchuk, a former Crimean Minister of Industry, to develop the Russian Unity party. Kirilchuk has since fled Crimea and has been trying to get his money back though the court system. Since 2009, he has been a member of the board in "Гражданский актив Крыма", co-president of Coordinating Council "За русское единство в Крыму!" ("For Russian Unity in Crimea! "), and leader of the all-Crimean public political movement Russian Unity ("Русское единство"). Since 2010, he has been a deputy of the Supreme Council of Crimea, elected as a member of Russian Unity, which had 4% of votes (warranting 3 seats of total 100 in Crimean parliament) during elections into Supreme Council of Crimea. During a talk show on the TV channel ATR on 3 March 2012, Aksyonov commented about a possible accession of Crimea to Russia: "I think the time for this process has already passed. Today we live in Ukraine. I have an Ukrainian passport, Ukrainian citizenship, so all problems should be discussed only in friendly relations between our countries". From left to right, Sergey Aksyonov, Vladimir Konstantinov, Vladimir Putin, and Aleksei Chaly sign the Treaty on Accession of the Republic of Crimea to Russia. Following the Ukrainian revolution, on 27 February an emergency session was held in the Crimean legislature while it was occupied by members of Crimea's self-defense forces. After sealing the doors and confiscating all mobile phones, the MPs who had been invited by Aksyonov to enter the building, passed the motion in the presence of the gunmen armed with Kalashnikov's and rocket launchers. The result was that 55 of 64 votes elected Aksyonov Prime Minister. Various media accounts have disputed whether he was able to gather a quorum of 50 of his peers before the session convened that day, and some Crimean legislators who were registered as present have said they did not come near the building. Others denied being in the city, and that duplicate voting cards stolen from the Parliament's safe were used in their name. Opposition deputies have avoided speaking out publicly out of fear of reprisal, due to threats received. Crimean Prime Minister Anatolii Mohyliov was barred from attending the session. Under the Ukrainian constitution, the Prime Minister of Crimea is appointed by the autonomous republic's parliament following consultations with the President of Ukraine. The Director of the Information Analysis department of the legislature's secretariat, Olha Sulnikova, has stated that an agreement exists with ousted president Viktor Yanukovych. The interim President of Ukraine, Oleksandr Turchynov decreed the appointment of Aksyonov as the head of the government of Crimea to be unconstitutional. 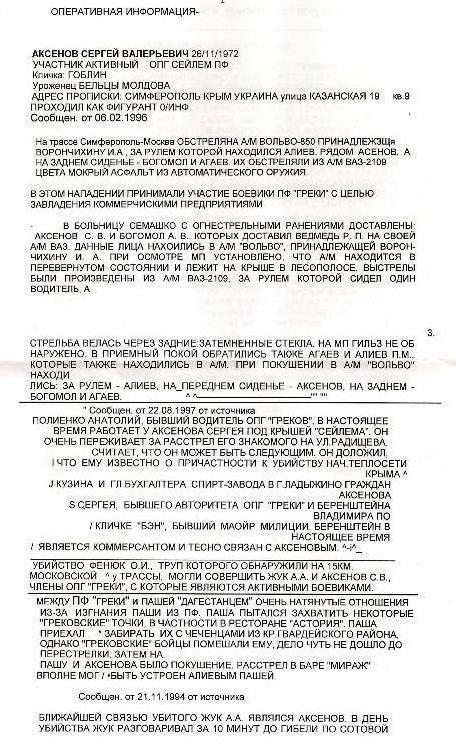 On 5 March 2014, the Shevchenko district court of Kiev issued a warrant for Aksyonov and Vladimir Konstantinov's arrest, and the Security Service of Ukraine was charged to bring them to court. Due to the Crimean crisis, on 17 March 2014, he was put on Canadian, EU and US sanction lists; his assets in these countries were frozen, and Aksyonov was banned from entering these countries. In the 2014 Crimean parliamentary election, Aksyonov ran as a candidate for United Russia because, according to himself, "The Popular Front" had delegated him to the United Russia party list. Aksyonov has promised that Ukrainian would cease to be an official language if Crimea joined Russia. "We use two languages on a daily basis – Russian and Crimean Tatar," Aksyonov said. "It's certain that the republic [of Crimea] will have two languages." Aksyonov's main goals for the immediate future of Crimea is to "use the funds, allocated for construction of infrastructures, for healthcare, energy and so on." Aksyonov has also pushed for the Crimean Bridge to be completed by 2018. Sergey Aksyonov has led efforts to stamp out dissent among ethnic Crimean Tatars over the annexation, saying "All activities aimed at non-recognition of Crimea's joining to Russia and non-recognition of the leadership of the country will face prosecution under the law and we will take a very tough stance on this." Aksyonov says homosexuals "have no chance" in Crimea, and that "we in Crimea do not need such people." He also promised that if gays tried to hold public gatherings, "our police and self-defense forces will react immediately and in three minutes will explain to them what kind of sexual orientation they should stick to." ^ "Sergei Aksyonov elected head of the Republic of Crimea". Russian newspaper (in Russian). Retrieved 2014-10-09. ^ a b c d e f "Putin's Man in Crimea Is Ukraine's Worst Nightmare". Time. Before dawn on Feb. 27, at least two dozen heavily armed men stormed the Crimean parliament building and the nearby headquarters of the regional government, bringing with them a cache of assault rifles and rocket propelled grenades. A few hours later, Aksyonov walked into the parliament and, after a brief round of talks with the gunmen, began to gather a quorum of the chamber's lawmakers. ^ a b c d e f g h i j k l m n o p q r s t u v w x y Mikhelson, A. Under nickname Goblin: who was ordered to hand over Crimea to Putin. Ukrayinska Pravda. 15 March 2014. ^ De Waal, Thomas (6 March 2014). "The Novel That Explains Putin's Crimean Land Grab". Politico. Retrieved 7 March 2014. ^ Associated Press (9 March 2014). "The 'Goblin' king: Crimea leader's shady past". The Japan Times. Retrieved 12 March 2014. ^ Haddon, Katherine (11 March 2014). "New Putin-Backed Prime Minister In Crimea Used To Be A Gangster Named 'Goblin'". Agence France Presse. Business Insider. Retrieved 12 March 2014. ^ Leader of the Crimean militsyia Moskal cooperates with the leader of organized crime group Aksyonov - attorney information. Crimean Information Agency. 2 November 2009. ^ "Prime Minister of Crimea" is elected a bandit who in 1990s had a nickname "Goblin" - Senchenko. Censor.net. 27 February 2014. ^ Ilya Somin (2014-03-07). "Crimea and the morality of secession". Washington Post. ^ a b "Meet 'Goblin' — Moscow's man in Crimea". Toronto Star/Metro News. 4 March 2014. ^ Roman Sohn (3 March 2014). "Ukraine: The Empire strikes back". EU Observer. ^ Oleg Shirokov (2009-09-24). "Salem as a Symbol of Criminality in Crimea". Salem News. ^ a b c d e f g "Pro-Kremlin Crimean leader Aksyonov denies allegations of criminal past". Kyiv Post. 15 March 2014. ^ Yanitsky profile at the LB. ^ "Аксенов не смог доказать свою непричастность к ОПГ и проиграл суд Бахареву". Crimean Information Agency. 10 June 2010. ^ "Премьером Крыма выбрали бандита по кличке Гоблин, — Сенченко". Izvestia. 4 March 2014. Retrieved 4 March 2014. ^ Премьер по кличке "Гоблин" Radio Svoboda, 4 March 2014. ^ "Депутат Андрей Сенченко: комсомол – "Сейлем" - парламент". Cripo. 2008-04-18. ^ Crimean parliament dismisses autonomous republic's government Kyiv Post. Retrieved on 12 March 2013. ^ "Gunmen Seize Government Buildings in Crimea". The New York Times. 2014-02-27. Retrieved 2014-03-01. Masked men with guns seized government buildings in the capital of Ukraine's Crimea region on Thursday, barricading themselves inside and raising the Russian flag after mysterious overnight raids that appeared to be the work of militant Russian nationalists who want this volatile Black Sea region ruled from Moscow. ^ Цензор.НЕТ. "Суд вынес постановление об аресте "марионеток Кремля" в Крыму". Retrieved 26 November 2018. ^ About granting a citizenship of the Russian Federation. Ukase of the President of Russian Federation. 10 January 2003. ^ (in Ukrainian) Users find videos, Aksenov looks like campaigning for the unity of Ukraine, korrespondent.net (3 April 2015). ^ a b "Crimea's new prime minister calls Yanukovych president, relies on Russian financial aid (UPDATED) - Feb. 28, 2014". 28 February 2014. Retrieved 26 November 2018. ^ a b "Preparations for Joining Russia Already Underway – Aksyonov". RIA. ^ "Депутат: Крымский премьер известен в криминальных кругах как "Гоблин"". Ukrayinska Pravda. Retrieved 26 November 2018. ^ a b c "RPT-INSIGHT-How the separatists delivered Crimea to Moscow". Reuters. 13 March 2014. ^ Gazeta.ua (1 March 2014). "Турчинов издал указ о незаконности назначения Аксенова премьером Крыма". Retrieved 26 November 2018. ^ a b The court gave the green light to arrest "puppets of Putin" in Crimea. Ukrayinska Pravda. 5 March 2014. ^ "Aksyonov will take part in parliament elections on the United Russia party ticket". Retrieved 26 November 2018. ^ "Crimean adaptation into Russia not smooth — republic's leader". TASS. Retrieved 6 October 2014. ^ "Kerch Strait Bridge to be built despite Western pressure — Crimean leader". ITAR TASS. Retrieved 8 October 2014. ^ "Despair and euphoria in Crimea six months after Russian annexation". Daily Telegraph. Retrieved 6 October 2014. ^ "Crimea Chief Says Gays Not Needed". RadioFreeEurope/RadioLiberty. Retrieved 26 November 2018. The new premier of Crimea will be the leader of Russian Unity. Ukrayinska Pravda. 27 February 2014. Lyudmyla Leontiivna Denisova is a Ukrainian politician and former Minister of Labor and Social Policy who on 15 March 2018 was elected Commissioner for Human Rights in Ukraine. The Council of Ministers of the Autonomous Republic of Crimea, briefly SovMin, was until February 27, 2014 the executive branch of government of the Autonomous Republic of Crimea, a republic within southern Ukraine. The Council of Ministers derived its authority from the Constitution and laws of Ukraine and normative acts of the Verkhovna Rada of Crimea which bring them into its competency. Russian Unity was a political party in Crimea, registered in October 2008. On 30 April 2014 a Kiev Court banned the party "from activity on the territory of Ukraine". Party leader Sergey Aksyonov was instrumental in making possible the annexation of Crimea by the Russian Federation. The party was based in Crimea, which has a Russian-speaking majority. The party was dissolved a year after the annexation of Crimea. Vladimir Andreyevich Konstatinov is a Crimean and Russian politician serving as Chairman of the State Council of the Republic of Crimea from 17 March 2014. Natalia Vladimirovna Poklonskaya is a Russian politician, serving as Deputy of the State Duma of Russia from 5 October 2016.